Allegiant, the latest film in the Divergent Series hits theaters this Friday March 18th. Does it tread new ground as the penultimate film in the dystopian young adult fiction franchise? Allegiant is the third chapter in the Divergent Series. Starting with Divergent, we meet Tris (Shailene Woodley) born into a post-apocalyptic world in the remnants of Chicago, surrounded by a heavily guarded wall where people are divided into a one of four main dominant personality traits into factions. She doesn’t fit in with the Abnegation (selflessness) she’s born into, and its confirmed by a test that shows she’s all four traits. She chooses to join Dauntless for their fearlessness and participates in conveniently helpful military training. While training, she discovers a plot of the evil Erudite (intellectual) leader Jeanine (Kate Winslet) to take power over all of the factions. The plot continues into the second movie with Insurgent, where we discover Tris’ love interest, Four (Theo James) is the son of Evelyn (Naomi Watts), leader of the many who have been cast from their faction. The two powerful women fight and Tris throws her support behind Evelyn to free the people from the forced suicides, mass casualties of the divergent, and Jeanine’s coup. The dramatic ending shows us Evelyn murdering Jeanine in cold blood and an announcement that Tris is a perfect divergent and, thanks to her mad cyber skills, their world being invited to open the doors of the wall guarding the city to join the rest of society. 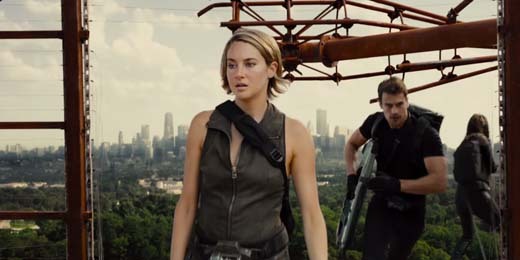 Insurgent has the curse of middle movies where it’s difficult to see where it’s going, setting up dominoes for the next movie to knock down. This brings us to Allegiant. Evelyn’s new government has the Erudite faction on trial for the crimes against the other factions. Octavia Spencer returns as Johanna, the leader of the Amity (peaceful). She’s lovely, the soft voice of reason that serves as Tris’ Jiminy Cricket. Call it a trope if you will, she steals the scenes she is in. An explosive trial scene shows how Evelyn’s public policy rivals the mob mentality seen in modern politics. This turns Evelyn’s allies against her and focuses them towards breaking through the wall. Johanna breaks off from Evelyn and there are increasing tensions calling for war. Tris and her gang escape and have meet the modern world, a so called perfect world. Hijinks galore ensue and highlights of really cool and creepy technology greet the divergent rebels and the audience. At times, the plot goes in the places you would expect it to go in YA fiction; angsty youth, short sighted leaders, lovers lacking the trust they should have for each other, etc. The twist set up in this film lacked a punch. That being said, this movie was more fun that the somber predecessor. There were some genuine jokes at itself. Peter (Miles Teller) ramps up the sleaze and schmoozing that makes his character so likable/unlikable and provides a few solid laughs to the story. Edgar (Jonny Weston) is Evelyn’s lackey, whose performance is reminiscent of a young Flea from the Red Hot Chili Peppers, and that is a really good thing. The CGI was obvious and overused at times but the creative technology finally left the small locked glass room and immersive scenarios of past films and offered up some really cool crafts, weapons and inventions. 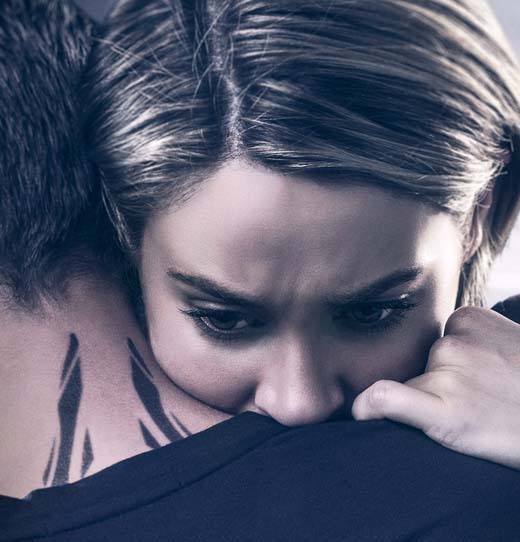 I enjoyed it more than Insurgent and I’m looking forward to the final chapter, Ascendant, to see how Tris and her giant eyes triumph over evil. Looks like you may have had more people at your screening than in any average theater around the country this past weekend. This screening was much emptier than the one for Divergent last year and in a much smaller theater. I think the bloom is off of this rose.